This matrioshka (Russian for nesting doll) comes from Belarus, a nation sandwiched between Poland and Russia. Belarus has always attempted to retain its national identity, which is difficult to do when you share a long border with a powerful nation like Russia. In fact, Belarus (pronounced Byelarus) means "White Russian." 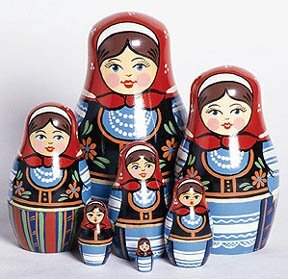 This nesting doll set represents a national, folklorish Belorussian nesting doll style. Like most traditional nesting dolls, this set features a young girl or woman, with a colorful scarf and apron. Interestingly, here the scarf is not overly detailed, doubtless intended to contrast with the detailing found in the apron and vest. It is there that this doll really shines. Unlike most nesting dolls, the artists have chosen to give this young woman a formal look--even adding strands of pearls. This, clearly, is not a peasant girl, but a well-to-do girl from the city.